“Yeah, that’s a fight I definitely would like is Anthony Pettis,” Cerrone stated. The good news for Cerrone, UFC president Dana White is also intrigued with the WEC vs. WEC matchup. “Let’s sign it. Today,” Cerrone interrupted. While Cerrone has had plenty to say about Pettis and his alleged “ducking” ways, to which the former WEC champion vehemently denied, “Cowboy” will do his best to put the verbal warfare behind him. “I gotta try and control my emotion,” Cerrone said of continuing the trash talk. “When I fight out of emotion, it doesn’t end up too well. I’m just gonna stay away from all the crap talking. We do what we gotta do. The fight’s gonna get signed, so sign, train hard and I’ll see you when I see you. 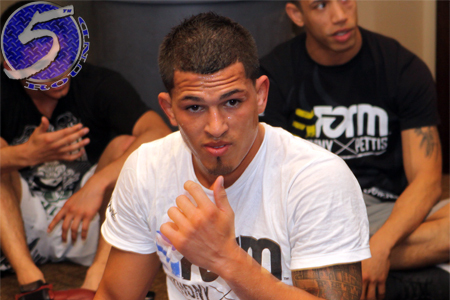 Pettis had shoulder surgery in late March and has been on the mend ever since. No word on when this 155-pound scrap might become a reality.